Some last minute "ditch stitching"
... and the quilting is almost complete. By the way, Autumn in Melbourne is nothing short of delightful; crisp mornings, plenty of sunshine and gentle breezes. We've turned back our clocks and it seems our evening are even longer. More time for stitching I say! Linking up today with more Creative Spaces @ Kootoyoo. Rita this one is a bit nautical I must say. Loving the stripes, so fresh and ready for summer (stateside!). Thanks for the peek, keep that machine humming. Your photos tell it all. I recognize the "stopping to admire" moment. I spend so much time standing back and admiring, I'd like another day of the week! This is just so beautiful... I'm happy to have found your blog! And as for autumn, it's springtime here in B.C., complete with sudden rain and hailtorms... hmmm, that's a lot like autumn around here too! Are your stitching sessions ever short of a marathon? This looks like it is going to be great! Looking forward to seeing it! loving the stripes - so fresh and clean looking and yes a little bit nautical as well! I think you are the one that got me hooked on to straight line stitching. And, I love it. And, I love this quilt. Question: how do you "mark" your quilt? It looks like you just have an indention in the fabric to mark the line. Rita, I'm confused. You have the Bernina 820 and I need the walking foot too? I'm going to call my Bernina dealer tomorrow. I thought the BSR foot handled everything. You have been busy. Me too, made another large rag quilt. No more though. On to something else. Hi Judy ~ I do still use the walking foot in preference of the dual feed. The dual feed foot seems to push the top layers of the quilt sandwich forward which in turn causes tucks and puckers. The walking foot "hops" rather than continuously pushing forward and therefore seems to feed the layers much better for quilting purposes. I so wish to be able to use the dual feed system for quilting rather than the walking foot. It would also allow me to be able to adjust needle position the full 9mm rather than by just 5mm, as well as use the quilting guides. Mr Bernina, I need a new walking foot which will let me do what I want to do with this machine! It's looking lovely! Crisp bright colors and gorgeous photos! I look at this quilt and think men's shirts, pyjamas and beach chairs. We are in Spring moving towards summer. Your new quilt is wonderful! 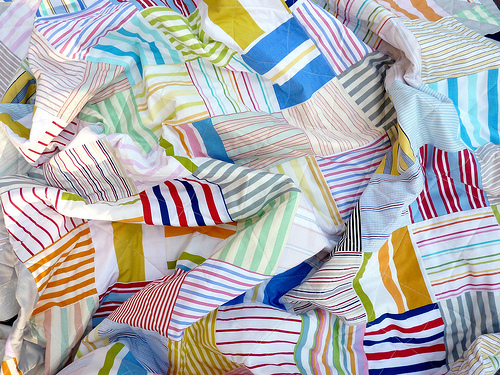 I don't think I have seen a quilt made with only striped fabrics and this with simple squares is my favorite!! !